As you probably know it's been over a year since Raspberry Pi hit the market. Mine spent most of that year in the drawer, so I decided to see if I can use it as low power server for a particular task. One of the ideas I had for a long time was to build a virtual radar type system that would allow me to see airplanes that fly over my area. There are purpose built systems that are quite expensive so why not to do it on a budget and have some fun with it? This is one of the ways in which the airplanes report their basic flight parameters (identification, current position, altitude, speed, etc) to the Air Traffic Control. All of this happens over radio broadcasts (completely public) at 1090MHz - at lest this is the frequency we are interested in. The full Wikipedia article is quite interesting and contains more information. All of that is easy to build and the cost is really minimal, using either a PC or a Raspberry Pi as I describe in this post. Raspberry Pi - From my point of view, the key benefit of Raspberry Pi is how little power it consumes. Mine never made it above 2W, so that would be something like ~£0.20/month in electricity. Raspbian - minimal version, actually custom install instead of ready made image I could download. One of the reasons was that I had a spare 2GB SD card and these days stock Raspbian comes as 4GB image. My Raspbian build runs only ntpd, sshd and dhcp client on the ethernet port - all other services are turned off. The key tool we need is called dump1090 and can be found on GitHub. The installation is really straightforward, thanks to an excellent blog post by David GM8ARV. There is actually several versions of dump1090 - original application created by Salvatore 'antirez' Sanfilippo and an extended one released by MalcolmRobb. There are differences under the hood as well as in the user interface. First of all, Malcolm's version includes improvements in decoding and processing functions. The difference became apparent when I switched from 'antirez' to 'MalcolmRobb' code base - the amount of airplanes picked up almost doubled, more planes had their flight numbers attached to them, etc. Another immediately visible change is the web interface - airplane icons replaced triangles and a panel was added to show the table with flights currently in range of our station (as seen in the screenshot above). Both versions can also show interactive table with the live data they receive - here's how it looks on my screen. 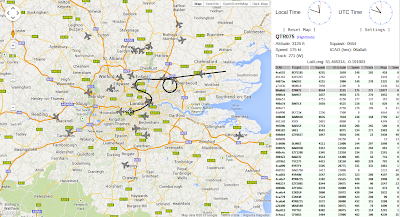 The second element of the configuration is the feed to Flightradar24.com - this is again described on their website. The description covers Windows version only, which I had problems with because the USB dongle didn't want to register almost anything, however this page mentions there's a Linux version available for both x86 and ARM architectures. Feeding to Flightradar24 requires registration as a data source to obtain a sharing key. Unfortunately I didn't find (yet) how to register using the Linux client or the website, so for the registration I used Windows version of the software and waited till it picked up two planes and activated my account. UPDATE: According to tweet by Flightradar24.com, at the time I'm writing this the sharing key can be obtained by either running their Windows client or sending an email to support@fr24.com. Once everything is installed it is time for a little automation. The Raspbian image I created has both versions of dump1090 installed in /opt and the currently used (MalcolmRobb) is symlinked as /opt/dump1090, so I can switch versions without any problems. 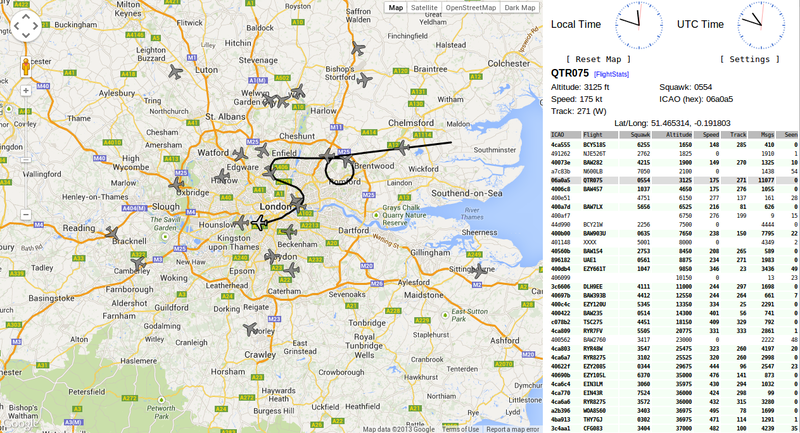 The Flightradar24 feed agent is saved as /opt/fr24feed_arm-le_233. Both applications are started at system boot time, but that happens via inittab instead of regular runlevel and dependency based boot process. I decided to use inittab because the image is built for a particular purpose - almost like an embedded system. Of course I will not let the applications runs as root, because dump1090 implements it's own http server and fr24feed agent is closed source - both will run as an unprivileged user. 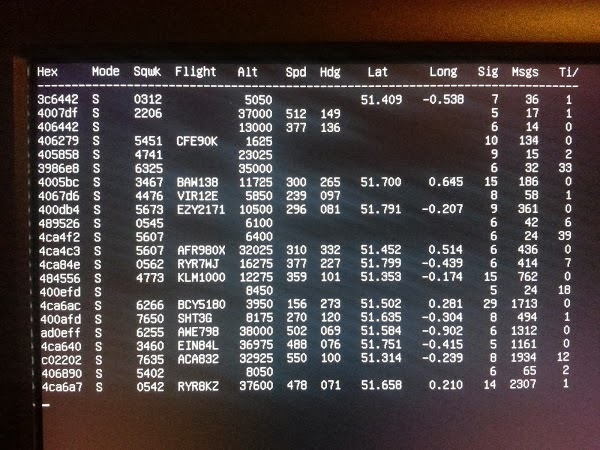 Inittab runs (only once, no restarts) a start script for dump1090 which executes the app as user adsb and redirects the interactive output (flights table) to tty1. Yes, the getty process is still there but I left it running to sort out device permissions (dirty hack - user adsb is added to the tty group to write to tty, if getty was not running device would be owned by root:root). In case the USB dongle is not connected, the app will of course die and will be restarted every 10 seconds. Additionally I moved the web interface from the default port 8080 to more usual 80. Putting it all together takes no more than 20-30 minutes if you have all the parts. I encourage you to try and build it yourself (follow the articles I have linked in this post). However if you feel it's too much work, you can try to use my Raspbian image, but keep in mind that you get it as-is, without any support, warranty or promises - you have been warned. If all worked ok you should see flights table on tty1, feed upload status on tty2, have a web server running on 80/tcp to watch your airspace and ssh server to manage the it all remotely. ... and if you don't have the parts to build it, you can always see the airplanes in my area (busy airspace during the day; sorry - no longer exposed to the Internet), that is if my receiver is currently on-line.